Image Size 29"" x 19"
Explaining that he became an artist in childhood because he couldn't do anything else. "My life was a total disaster until I was 20 years old. My one and only ambition was to be a game warden, so when I'd finished my education, I went rushing out to Kenya with the incredibly arrogant idea that I was God's gift to the National Parks. It was a disaster. I knocked on the door of the Head Gamewarden in Nairobi and said, 'I'm here, can I be a game warden?' I was told I wasn't wanted. My life was in ruins; that was the end of my career in three seconds flat." "Up to that point, my only interest in art had been as an escape from the rugger field. The game was compulsory at school and I was terrified of it. I couldn't see any fun in being buried under heaps of bodies in the mud and having my face kicked in. I fled into the art department where it was more comfortable and painted the most unspeakably awful painting of birds." 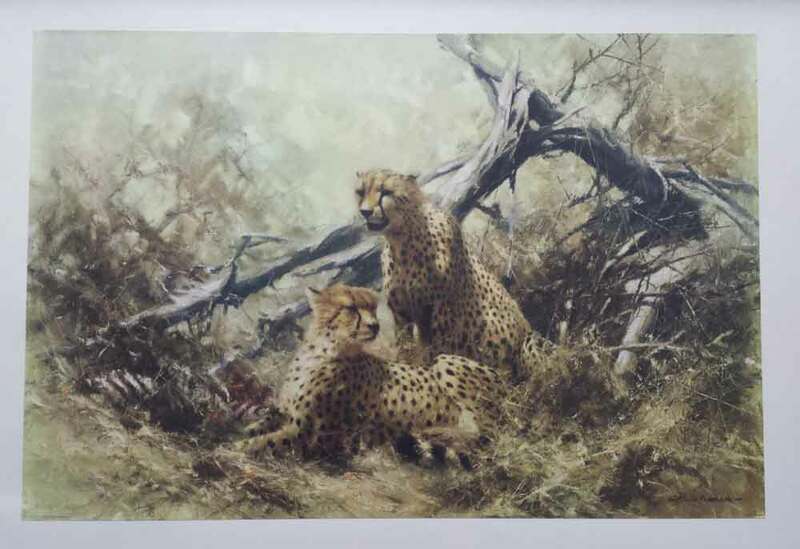 30 years experience and a collection of hundreds of David Shepherd signed, limited edition prints!